Now you can watch Mother Nature’s Magic as eggs hatch before your eyes. 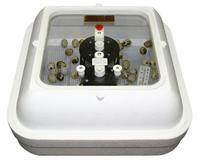 This scientifically designed styrofoam incubator weighs about 8 pounds, is 18” x 18” x 7-1/2”, draws 25 watts. The Circulated Air Flow Model makes incubating eggs more reliable. The air flow permits the incubator to be operated at one temperature for all sizes of eggs and climate conditions. It holds a more uniform temperature. The Full View Electronic model comes with an electronic thermostat. This thermostat comes with a built in fan and is so accurate you will not have to set the temperature. The newer allows for setting of larger eggs such as goose without the use of an expansion ring. Incubators should be in a room where the temperature doesn't change much, and located in an area where there aren't fans, air conditioners, or heat vents blowing directly on the incubator. This helps the incubator stay at a more uniform temperature inside. 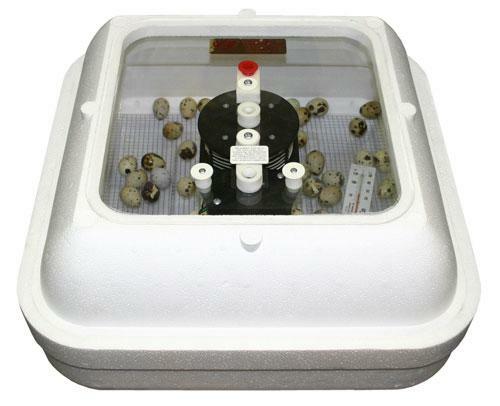 Without an automatic turner in place, the incubator will hold 50 duck or chicken eggs or 130 quail eggs. With the turner the incubator will hold 120 quail, 42 chicken, and up to 12 goose. will the chicken egg turner work for Narragansett turkey eggs? If you can fit the turkey eggs into a large egg carton, and close the lid comfortably, then the turkey eggs would fit in the chicken egg turner. Otherwise, you may need to utilize the goose egg turner for your turkey eggs. Yes, water is added to the bottom of the incubator, into the reservoir channels. I just purchased the incubator with smaller windows last year. Will my turner, etc., that I already have, fit into the new one with the bigger windows? Yes, it is the same turner used in the picture window or full view incubators. My Hoverbator incubator is about 4 years old and has recently stopped producing heat. The fan still works but I discovered as I went to turn the eggs, the inside was room temperature. Is there a replacement part I can order to fix it? Thank you! Do you have the full view or picture window incubator? We do have replacement parts available, but it will depend on which incubator you own for what parts are needed. how many quail eggs will the automatic turner hold? The turner will hold up to 120 quail eggs. How many chicken eggs does the automatic turner hold? The automatic turner will hold 42 chicken eggs. Can the chicks stay in this incubator once they're born? Chicks can stay in the incubator mostly until they dry, but the hatched chicks seem to help encourage the others to hatch, just by being in there. Usually, just keep them in there for a few hours. Then they need to be in their brooder situation.